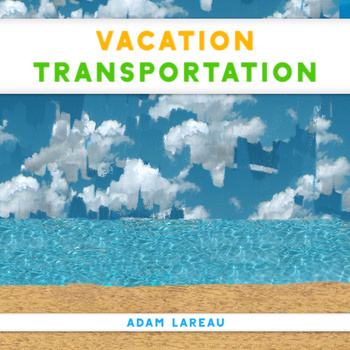 Vacation Transportation is an art-pop examination of how location and travel affect our personalities and realities, filled with catchy 60s and 70s-inspired tunes. From places like Aralethia, Home of the Orangest Sunsets, to San Largo, Home of the Most Homes Of Things, you will have a travel experience exactly like everyone else's, with pre-approved vistas for your digital films, and foreign cuisine from top quality corporate franchises! Walk in the footsteps of other wealthy tourists as you explore "Sun Is Fun"! Ride the cerulean waves of probability at "Quantum Surfing"! Wonder what has become of yourself with "It Makes Up My Mind"! Experience new cultures and existential dread with the bouncy sounds of "Dislocated Heart"! Trigger instant nostalgia with the glorious view from "It's Too Late To Be Yesterday"! 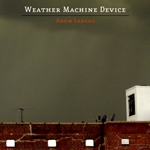 At first, the Weather Machine Device was heralded as a humanitarian miracle. Plentiful rain and temperate climates could be had wherever a device was installed, and for a few short years there was peace. Unfortunately, it wasn't long before the Device was weaponized, and droughts and devestating storms soon ravaged the lands. Self-proclaimed Island Kings retreated to heavily defended ocean fortresses, ransoming the world's weather in exchange for fortunes. Within a year, all was destroyed. After vast ages, descendants of survivors finally arrived at the remaining fertile fields surrounding the North Sea, and a new future was born. A perfectionist's lament. Inspired by 'Station to Station' era David Bowie, but ultimately probably not that similar to it. The lead single from my upcoming Chillwave Teen Pop band concept EP - The Moldy 8Traxx Are The Faded and Jaded. Just kidding, I'm not actually going to do that. A brief attempt at both political commentary and 70s TV theme songs. Written and recorded in about two hours, which is also how long it stayed relevant. A.K.A Conversations I Overheard In College. A very early version of the lead track from Vacation Transportation, probably recorded when I was in 11th grade. Using samples from a household object for a song that anthropomorphizes said object is conceptually pleasing. Part of what was to be an "Emotional Suite". Hope -> Jubilation -> Faint Hope -> Danger. Although I am realizing now that Danger is not actually an emotion. What I would sound like if I was Stereolab. Repetitive and French. In which I try to be Pizzicato Five for some reason. From my high school days. Back then I used to sing like I was scared someone would actually hear me. The epic follow-up to Pixel Connect. A dramatic adventure across a strange land. Collect and Connect were appetizers. This is the main course. More than 150 levels of action-oriented puzzle solving. Collect same-colored pixels to try to become the Monopixel. Be one with everything, by making everything one with you! Pictures from a trip I took to New Mexico. From a trip to Amsterdam, Geneva and Paris. All of the pictures start as pixels at the edges of the screen, and as you use the keyboard's arrow keys, they will move to the center, and gradually become a full photograph.